You may know your Google Home from your Amazon Echo, but which smart home speaker is the best? T3 knows. T3 has yelled at a mansion’s worth of speakers and run them through gruelling tests to bring you a definitive answer, revealed in our cover feature. They’ll do more than organise your calendar, and will revolutionise your entire house - and we have them in the latest issue, redesigned from the ground up. We’ve gone beyond smart speakers too. Care to apply intelligent lighting that changes its hues? We’ve got that. How’s about a smoke detector that’s savvy enough to know when you’re burning the toast and not your entire house down? Got that as well. It’s the issue that could well save your life. From smart home to craft brews, this issue’s Man Vs Tech pits an all-in-one beer brewing kit against a keen home brewer to see who can make the best ale possible. We share our know-how and show you it’s easier than you might think. Continuing the theme of relaxing with the indomitable Royole Moon, a headset that beams an 800-inch cinema screen right in front of your eyes. You might never go to the movies again. That’s not all. Join us as we go behind the scenes at Disneyland and the people responsible for the happiest place on earth spill its secrets, review the best DSLR-beating cameras, get behind the wheel of a Rolls Royce Ghost, showcase adventurous sky-touching trail runs, and heaps more. 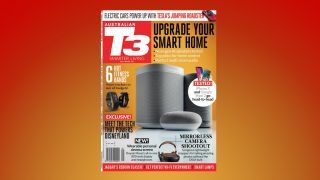 You’ll have to pick up issue 181 of T3 Australia, available right now in all good newsagents, and online from iTunes and the Google Play store and see it for yourself.